Victorian trade card for James Pyle's Pearline Washing Compound: Elizabeth Handler, whose terrific genealogy blog From Maine to Kentucky played a key part in the researching of this item, writes: "Thanks for the reference to my blog! You've got some great links here. You can also search eBay on Pyle Pearline and see what's available for sale. 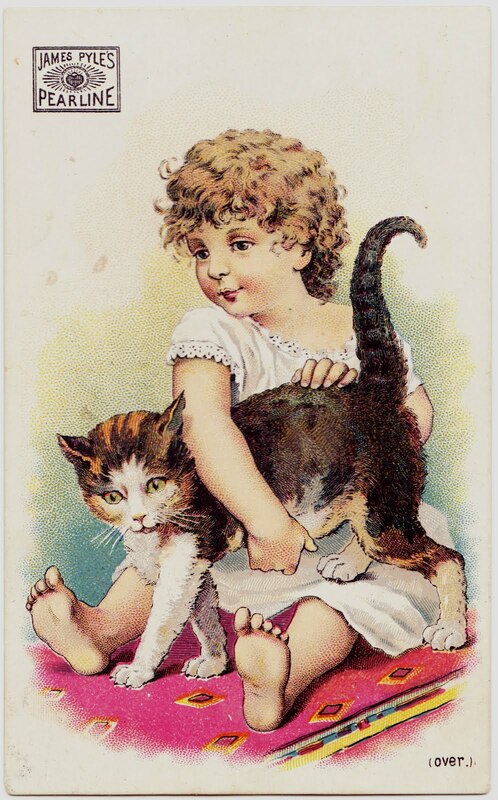 I've always found it fascinating that so many of these Victorian era advertising cards have survived. And what variety!" Saturday's postcard: Ringkirche in Wiesbaden, Germany: mshatch, who authors Unicorn Bell and mainewords, writes: "What a beautiful church." I got a lot of responses on this one, including "ew" and "ick". Linda H.: "Lose the gelatine, use vodka instead of cold water and put the olives on a little plastic sword. NOW that will make you twinkle!" Cindy Snyder: "Tomato Twinkle is actually an aspic (as·pic/ˈaspik/) -- a jelly made with meat or fish stock, usually set in a mold and used as a garnish. If you Google tomato aspic, you will see some pictures of this retro salad. I'm sure Joan and Sarah will be anxious to make one for you." My response: "Well, I Googled "tomato aspic." My heavens, the horror!! Why, why, why did people put OLIVES in those things? And this one might be the worst way to waste shrimp that I've ever seen." Manger scene at St. Mary's Episcopal School for Indian Girls: Elizabeth Conway writes: "I found a copy of 'The Bugle', the quarterly bulletin of St Mary's Episcopal School from March 1978 among the papers belonging to my aunt. She was a member of the DAR and they supported the School for Indian Girls. There was a picture of a snowy roadway with the rear of the manger that couldn't be removed until it thawed. They had had 68 consecutive days with the temperature below freezing." Above: The caption on the back states: "The School Chapel - Ascension Church." 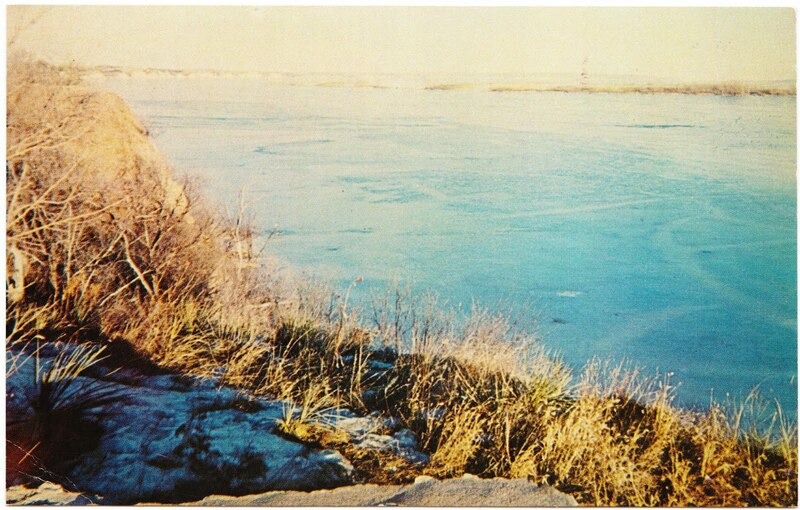 Above: The caption on the back states: "View from Bluffs of school campus showing Lewis and Clark Lake and across the river - the state of Nebraska." More miniature photographs from 1930s New York City: Wendyvee of Wendyvee's RoadsideWonders.Net writes: "These are FAB! Love that it was the 'new' Rockefeller Center." 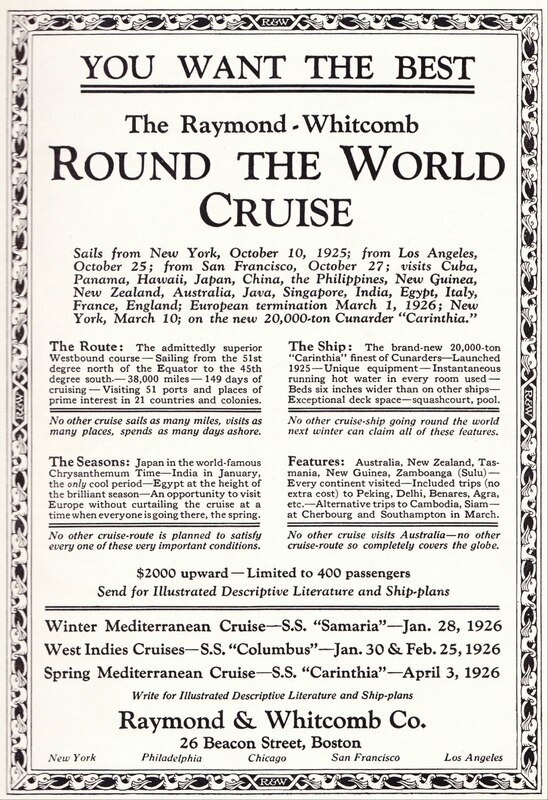 Cruises offered in a 1925 issue of National Geographic: Anonymous writes: "My father was an Engineer on the P&O SS Kaiser I Hind (Emperor of India) between 1918 and 1928. 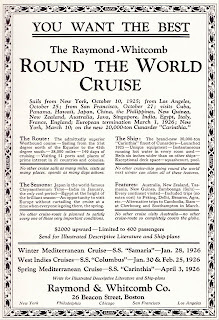 They did a Raymond Whitcomb cruise from New York to the North Cape of Norway. Among the passengers was a man named Colgate. I would like to have any information you might have on this cruise. Thanks." OK, folks. Sounds like that could be a whole followup post, after some research. (And we do like a good mystery.) Any ocean-liner experts out there? 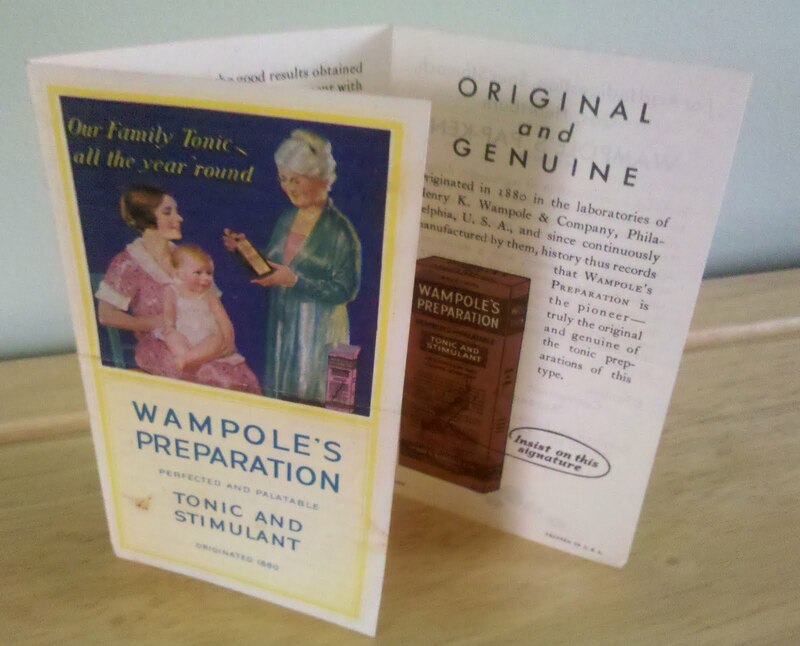 Delving into Henry K. Wampole & Company: Lisa WRS writes: "I love your information. One of my family names is Wampole and they resided in the Philadelphia area. I am currently trying to connect the family history I have to see if he is listed! I had never heard of the company until I bought a 1930s bottle with his Preparation label on it and I bought it for the family name. There is definitely always more to our family stories!!! Thanks again for the history lesson." Three sci-fi paperback covers with UFOs (and one with a chimp): Anonymous writes: "The saddest thing about 30th century Earth is that we haven't come up with anything newer than rocketships or atomic weapons. A nine-century-long drought of innovation ... a second Dark Age!" And Linda Chenoweth Harlow (on Facebook) adds: "It's when you have Flying Monkeys that there's trouble!" John Myers (on Facebook): "You should take the train between Washington and New York sometime. You would see three hours of properties that are worse than this ... with some of the worst just north of the Baltimore station!" 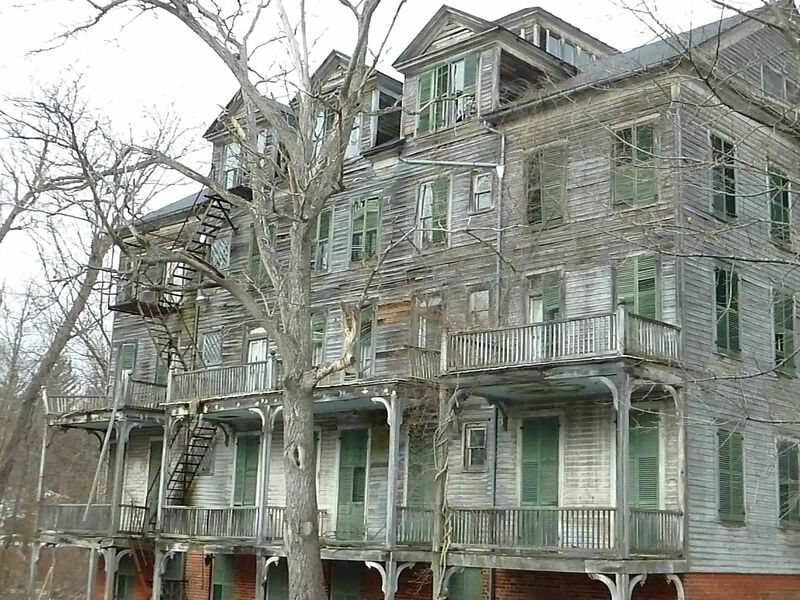 Ted E. Palik (on Facebook): "I love pics of old rundown abandoned buildings and deserted landscapes. I like to imagine what they might have been like." 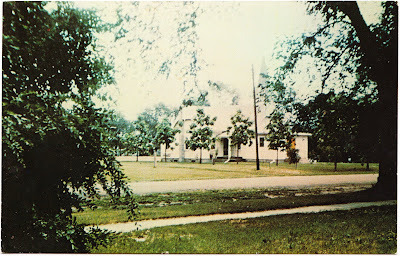 Saturday's postcards: Two greetings from 100+ years ago: Jim Fahringer writes: "This is so neat. I have been collecting postcards for 40 years but it never occurred to me to do genealogical research on the writers and recipients. I guess I started collecting before the PC and Internet. Thanks for sharing this added interesting side to postcard collecting. I will definitely get out some of my oldest cards and try to do research on them." Every piece of paper tells a story!